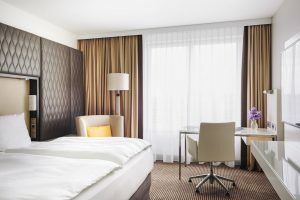 With more than 377 rooms and suites, 18 conference rooms, the newly conceptualized restaurant BLEND berlin kitchen and bar as well as a Fit and Spa Lounge with the city’s’ biggest hotel pool, the Pullman Berlin Schweizerhof combines avant-garde interior design with simple functionality. Ideally located in the heart of Berlin, the most important sights and places like the famous shopping area « Kurfürstendamm » as well as the « Zoologischer Garten » are only a few steps away. As the modern brand Pullman promises, the 377 rooms including ten Deluxe- and ten Junior-suites are stylish as well as functional. 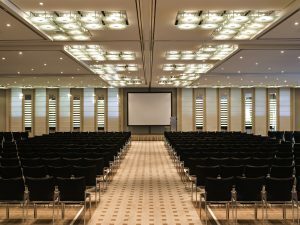 18 conference rooms with 1,610 square meters in total are exclusively available to meetings and business trips, among these are a ball room with 692 square meters as well as the innovative « Business Playground ». The latter is based on a Pullman-launched meeting concept that deliberately breaks with the conventions of previous meeting and discussion rooms in order to create space for creativity. 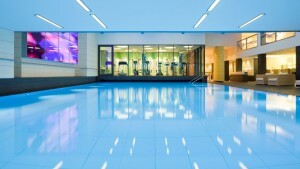 Furthermore, the hotel includes an exclusive Fit and Spa Lounge and the city’s biggest hotel pool with 18 by 10 meters. The global nomad’s world is dynamic and cosmopolitan. And our world is your playground. Elegance and functionality, work and relaxation. In Pullman’s airy rooms and suites, business and leisure blend to form a armonious whole.